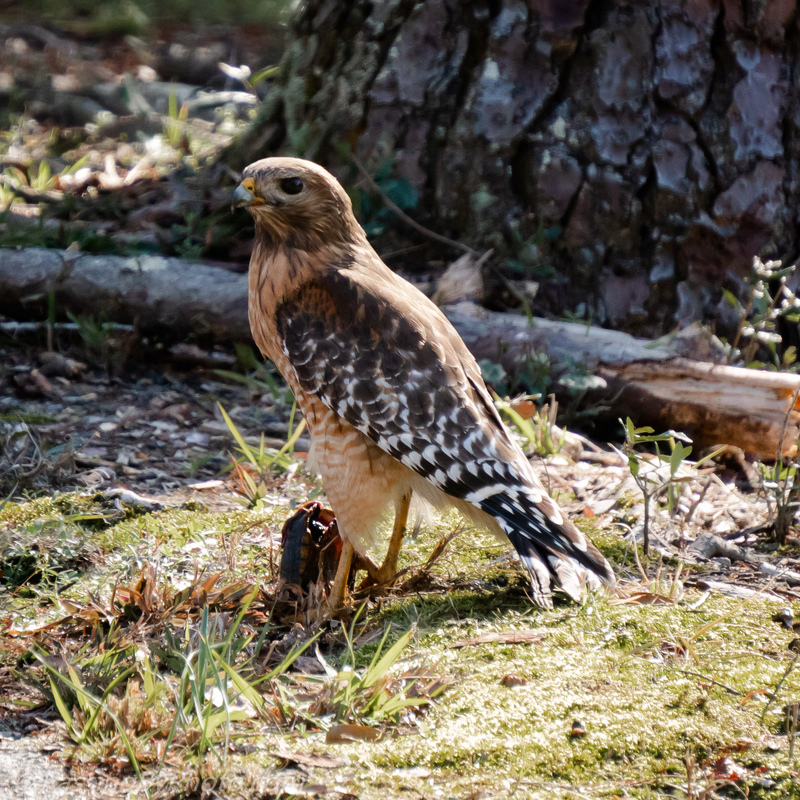 I saw this Red-shouldered Hawk standing on the ground at the side of a pond and approached slowly. Other times I’ve seen them do this the bird was squeezing his next meal, but I didn’t see any food here. Afterwards, when I zoomed in on what I thought was a tree root or Cypress knee, it turned out to be a turtle standing on its end. 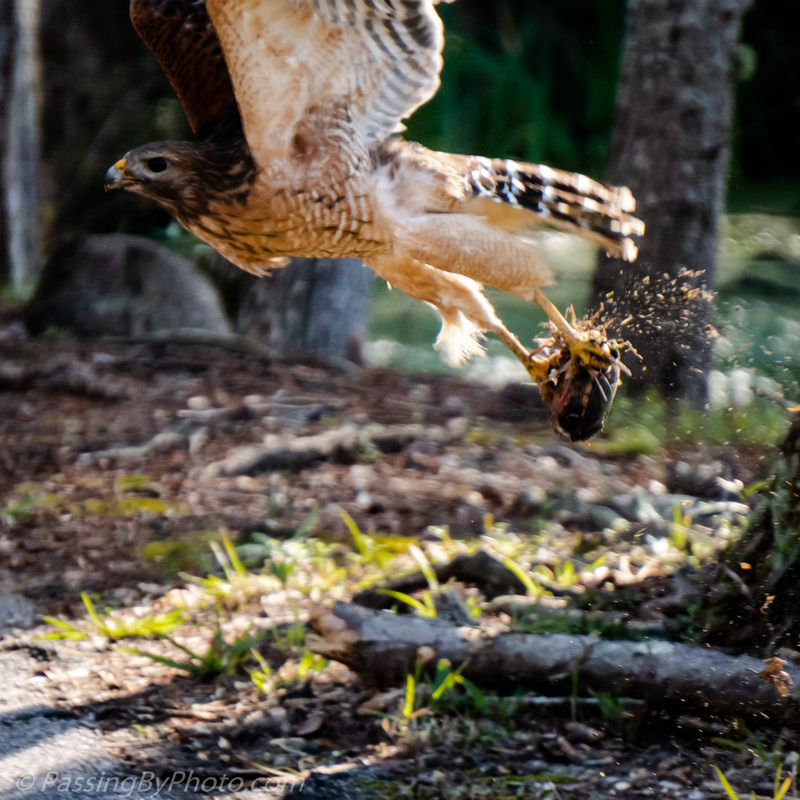 I don’t know what made the hawk take off; I was standing still and the only human in view. These were taken with the Sony Alpha 6500 which uses an electronic viewfinder, not the best arrangement for images of birds in flight due to the lag time. Sony Alpha 6500, Sony 55-210 mm, at 210 mm. Recently, I heard a thump as a baby squirrel fell from a tree. Shortly, a hawk dropped down from the tree and carried it off, leaving the mother squirrel in quite a tizzy. Hard to watch, but such are the ways of nature. Ugg. That is true, Rebecca—everyone in the food chain needs to eat even as the details can be tough to observe. Wow, a turtle, that’s a different meal to see a hawk eating! Nice sighting, Ellen! I’m still rather surprised, and wonder if the turtle was out of the water when he got nabbed—this was about two feet from the pond edge. Thanks! Thanks, David! Certainly not something I expected! Thanks, Werner, glad that you liked them! Thank you, John, and thanks for stopping by!